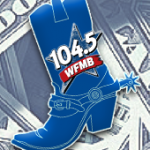 The Free Money Boot is full of CASH! But the only way to get the money is by guessing just how much LOOT is in the BOOT! You’ll have three chances to try your luck each day: at 7:15 a.m., 12:15 p.m. and 4:15 p.m. When you hear the Cue to Call, dial 217-525-WFMB (9362). The first listener to correctly guess the amount WINS the cash. If you guess incorrectly, we’ll let you know if the amount you guessed was too high or too low, but that’s as much as we can tell you! Tune in to win! Good luck!